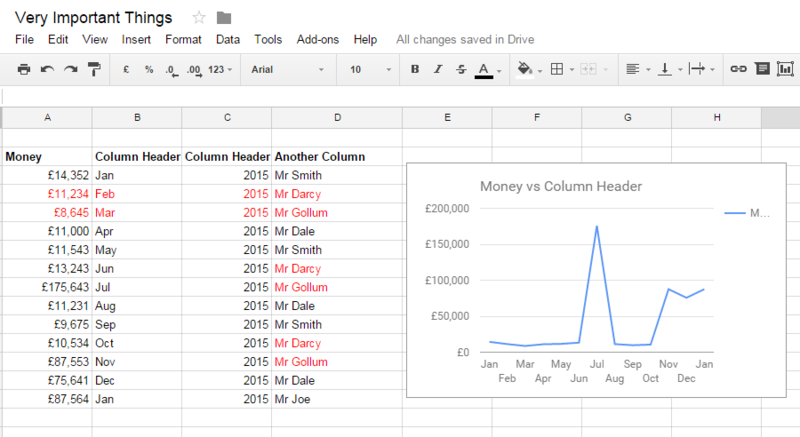 If you use Google Sheets you’re probably familiar with how useful it is to be able to scroll through changes made. However, unlike Office, Google doesn’t seem to give you any easy way to remove personal information or revision history before you share a document. Here’s my very important spreadsheet with columns of stuff, for people, about things. When I share that with people I’m keen not to let them view the revisions. I also might just want to draw a line in the sand and remove any revisions up to today so that the list is cleaner in the future. In Google Drive, right click the Sheet entry for your file and choose Make a Copy. Now right click your original file again and choose Remove. This will delete the file to your trash and leave you with the copy file (prefixed with “Copy of”). Right click the “Copy of” file and click Rename. Rename this to match your original filename. Your revisions have now been removed. Open up your new spreadsheet and you can check the revision history.